I had grand plans for the Pet theme, but sadly real life got in the way (again!)..... But I wanted to share something, so here are three greetings cards for use with MogHughson's Postal System. If you download these cards along with MogHughson's Postal System, then your sims will be able to send these cards to their friends, relatives and acquaintances in the neighbourhood. Sims who receive these cards will receive a small positive boost to their friendship level with the sender. Rather than using clipart/free images to make this set of cards, I took pictures in game to use for the fronts of the cards. These cards are cat-themed - but they are also Kat-themed! "But Lauratje86, whatever do you mean?!" I hear you ask! 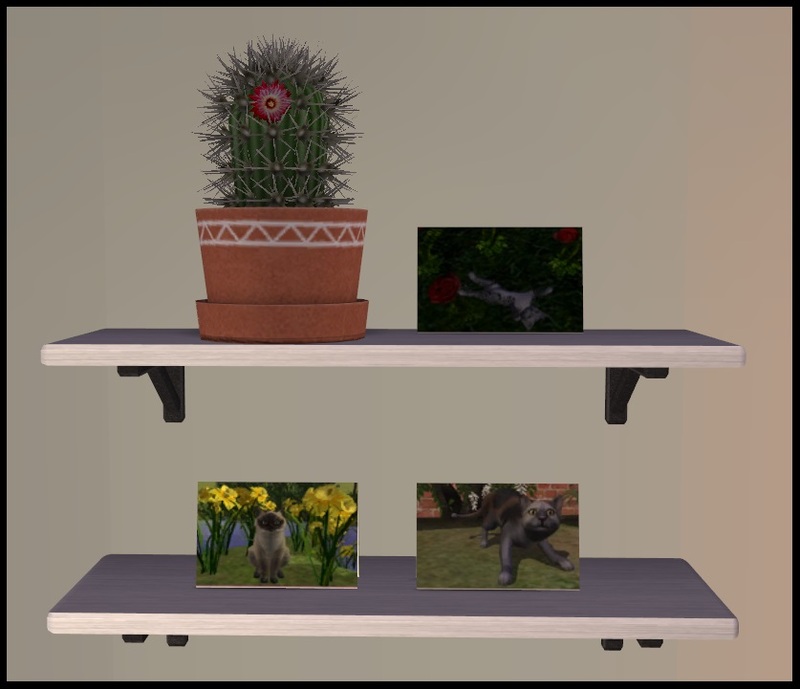 Well, the pictures on these cards are of some of Ginia Kat's cats, which were recreated and shared by MadameMim over at Genensims. The cards feature 1. Waggles (as a kitten), 2. Boots and 3. Scout. I'd planned to make one with Maggie as well, but the ideas I had just didn't work out. I also used some seasonal plants by bienchen83, Gwenke33, Raynuss and DiCreasy in the pictures which I took for the cards. In my game the Kat family owns a pet store, where they sell these cards, but if you don't want/have a Kat connection in your game they could just be pictures of random cats. So I hope that they will be of use to plenty of simmers, regardless of whether or not they play EAxis premades. The cards all have their own unique GUID's, so they won't overwrite anything in your game. The text inside the cards reads "Just To Say..... I'm so happy that we're friends!". Many many thanks, as per usual, to MogHughson, for not just creating and sharing her Postal System but for providing templates and detailed instructions to allow people to create their own greetings cards! :-) I do love making them! Thank you to the creators of the CC which I used in the pictures for the front of the cards. Special thanks to MadameMim for making the cats! Thanks to the makers of SimPE - where would the simming community be without you?! And thank you to the Mod The Sims owners, admins, mods, creators and all members for making this such a great place to share custom content! Lauratje86 Cat-Kat Friendship Cards.rar | Description: Three Cat-Themed Friendship Cards For MogHughson&#039;s Postal System. Five Spooky Day/Halloween Cards For Use With MoghHughson's Postal System. These recolours may or may not be endorsed by lauratje86. 12 New "Thinking of You" Cards to go with MogHughson's Postal System!